Free More Happy Life eBook! Like this episode or article? Never miss another post by subscribing to the podcast and the free newsletter. Also follow us on Instagram and Facebook. When I was a kid, I remember I would make friends almost every day on the street. It was probably because I was really good at popping a wheelie on my bike. 😉 I just turned 35 and though I feel super healthy, have a steady job and have enough savings to buy my first home, it has been hard to make new friends in my 30s. It’s not as easy as just popping wheelies in the street, but it is very important to keep making friends, especially as an adult. Loneliness costs a lot. In fact it costs almost $7 Billion per year just in the US (1). A non-profit in the UK called The Silver Lining has taken the initiative to decrease loneliness with a 24 hour call center for people who have no one to call (2). They claim to take 10,500 calls per week with over 50% of the calls saying that they would literally have no one else to talk to. How many people would you feel comfortable discussing an important personal issue with? In 1985 the average response to that question was 3 and in 2004 that dropped to 2. In that same study 25 percent of the respondents said they had zero people to talk to! (3) That was in 2004 before social media became much more mainstream. With instagram and facebook having over a billion users each, we are more digitally connected, but less tangibly connected than ever. Why does this matter? Well, loneliness doesn’t just make you feel like an L7 loser, it’s also really bad for your health. One study showed that chronic loneliness is worse for your health than smoking 18 cigarettes per day (4). And, on the other side of the coin, the healthiest and happiest people on earth spend an average of six hours socializing per day! (5) Seriously?! Okay so we get it, we need more connection than our phones and our trusty volleyball named Wilson. But how do you make friends as an adult? Well, how did you do it as a kid? Maybe you can reach back into your 7-year-old self and make friends again. Kids basically do a lot of the following tips I suggest below. Here are six trusty ways to make new friends as an adult. Okay I’m guilty. I use my phone way too much. 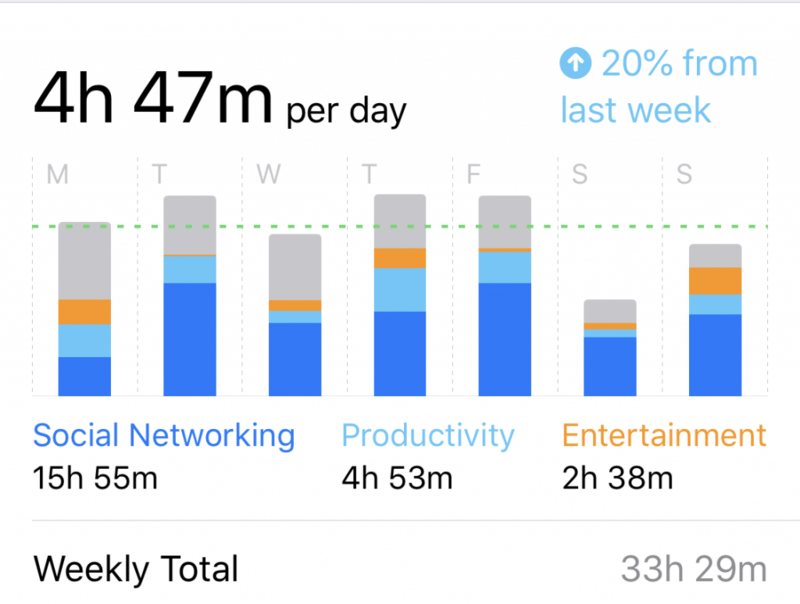 I’m kind of embarrassed to show my screen time stats from last week, but here we go. This was obviously a high usage week being 20% up from the week before. Also, I use my phone for my day job engaging and creating on social media, but no excuses. I was on my phone a lot! While I spend almost five hours on my phone, research shows that the happiest healthiest people on earth spend six hours a day socializing. I am happy to say that the day with the lowest usage was when I was spending time, in person, with a dear friend. We sat and talked for almost four hours! It was great! 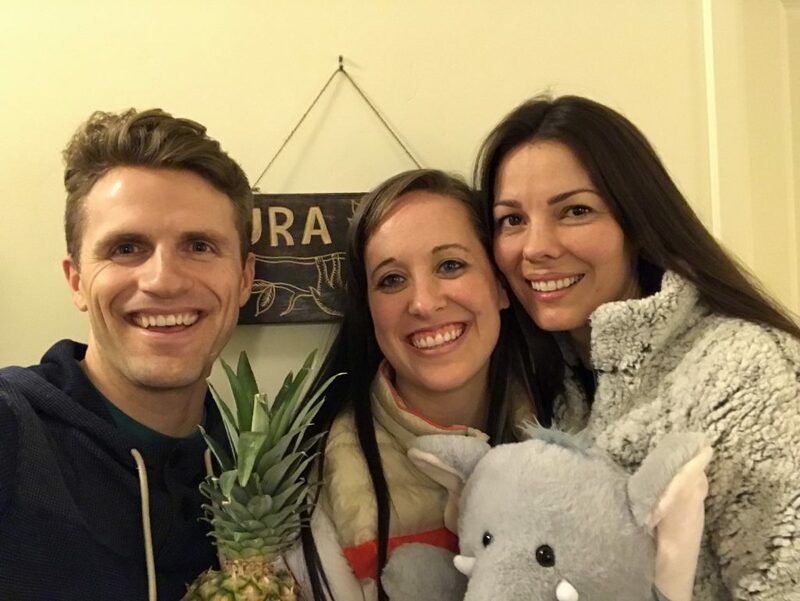 Other than for taking a quick selfie with our pineapple and newly adopted stuffed elephant (see below), no phones were touched or picked up the whole time we were together! It was amazing. So even if your reality is a bit like mine and your phone is used a ton, take a least one day a week to put your phone down and connect with someone. I think I often get nervous to talk to random people in the elevator or on the street and instead of engaging with them or smiling at them, I just pick up my phone as if email or some random text message is more important. Sometimes I do get a really important call or text, but if you’re trying to make new friends, maybe try something new. Have you ever tried a day without a phone? Like the old school when they were only connected to the wall? 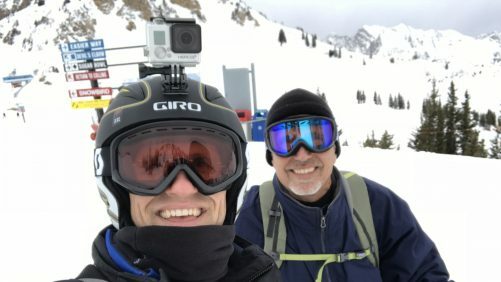 I did it for a week once (see episode 73) and it was amazing what I learned about myself and how much I was able to connect with people. Try it. Or maybe try the light phone and see how it impacts how much you connect with people. It takes courage to make a new friend as an adult because to be intimate, you have to reveal yourself to someone in ways that are very vulnerable. There is a certain amount of risk associated, but if you never risk being known, you’ll never truly feel loved for who you are. Once you have met someone and been a little vulnerable with them, why not take it a little bit further with a commitment ritual? You have seen in movies where mere friends become blood brothers or when people spit in their hands and shake on it. I’m not saying you should blend your spit with one of your friends like you did as a kid, but why not have a secret handshake? Or share a password that only you know. Exchange a handwritten note to commence your friendship or even create an “established” certificate that says the date and time you became friends and hang it on your wall. I personally have a friendship wall where I hang pictures of me with friends so that I can get them off my phone and somewhere I can see them every day and remember to reach out to them. After you establish a date of your friendship, celebrate your friendiversary by doing something special or going back to where you first met and savoring the bond between you. This is crazy vulnerable for some people (especially a lot of men), but tell me if you don’t feel more connected to this friend after you do this. In Okinawa Japan, from a very young age, the people are placed into what are called Moai, or committed friendship groups, for life. They help each other and are committed to each others’ happiness and wellbeing no matter what happens. We could all learn from this ritual and practice. Let me know what ritual you come up with to commit to your new friend. 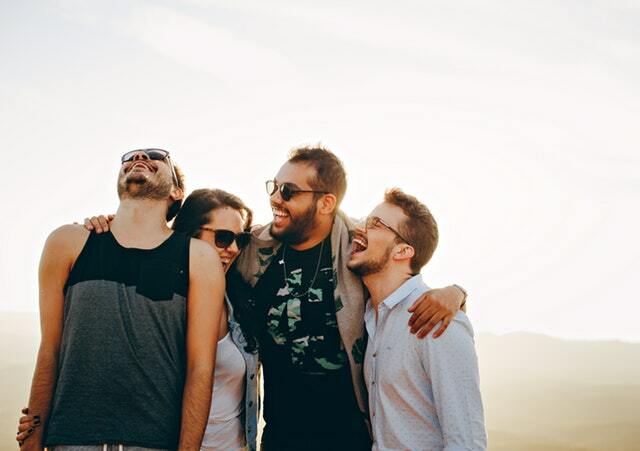 This may seem like a drastic option, but in a longitudinal study that followed best friends over 19 years, researchers found that participants had moved an average of 5.8 times during that period (7). Have you had a best friend who moved away and then faded into a memory? It’s sad, but it happens often. It doesn’t take long for a best friend to fade from BFF status to “somebody that I used to know.” If you are super BFFs, get vulnerable and tell them that you are thinking seriously about moving closer to them and see how this impacts your friendship. One of my friends and I used to have a running agreement to visit each other every 6 months. Though we lived hundreds of miles from each other, it kept our friendship from fading into memory-only status. Just remember that the healthiest and happiest people on earth are the ones who are in close contact with the people they love. Not just family, but friends too. And our close relationships are the number one predictor of our health and life satisfaction (8). Too many middle-aged adults find that they could probably still name a lot of people that they are close to, but who recently entered into a new stage of life. You are single, you have a best friend who is everything to you. You hang out often. You even double date together. Then one of those double dates turns into a fiance of your best friend. You are ecstatic for them and are even their bridesmaid or best man. But then the honeymoon comes and they come back and they are now married and you are now single. You are still close, but now are in a different stage of life. Because of social norms, it feels less comfortable to just swing by and hang out because, well, because they are married now. You may not relate as much on everything within your stage. And if you are the married one, it can be just as difficult. Sure, you have your married your true love and hopefully best friend, but what about all your other friends? Especially when you start to face the responsibility that comes with your marriage. It’s not too different than running a business with a partner. And then when you start having kids and your friend is still in single land, you enter a totally different stage. With each new child comes a different stage. It can get really easy to just say in your head: “We just grew apart”. Did you? It will likely take courage to reach across stages and express interest in your friendship regardless of helping them change diapers or finding time outside of their married life. But why do you have to end a beautiful friendship because they have babies and a spouse and you don’t? It doesn’t have to end but it does take vulnerability and perhaps more effort to keep the friendship alive. 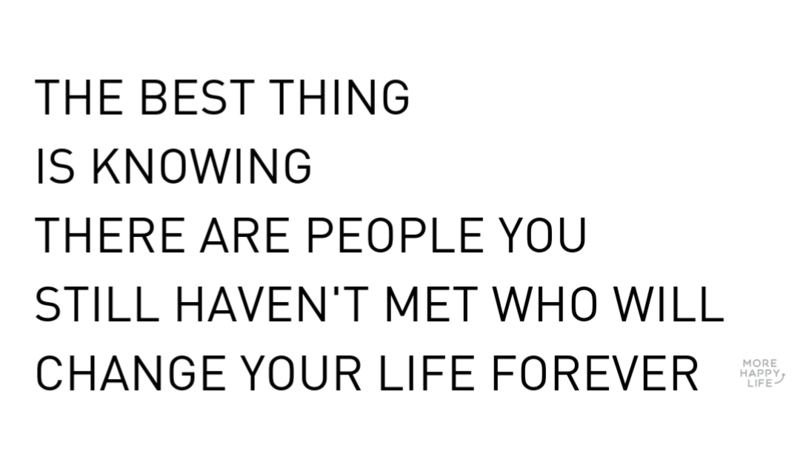 How many friends can you think about right now that you have made over the years? How many of them are more like memories than close friends? It may be sad to think that a best friend has become a memory to you, but the truth is, at one point in your life, you didn’t know these people and you had to engage in activities that helped you become friends. You had to invest time and energy into making that friendship. You probably experienced some sort of harmony between you. Why not recreate that formula? And then you aren’t just starting from scratch with a new person, but you have even more relationship capital to build on with them. Just remember one thing: LET THEM BE NEW. Even though you have a pretty solid idea about what you think about them and what kind of person they are, let them be new. You may think you know everything about your old friend and they may think they know everything about you. The truth is that you are constantly changing and evolving and if you open up, you’ll discover this friend. An old friend can become a new friend because the reality is, they are a new person and so are you. https://www.inc.com/amy-morin/americas-loneliness-epidemic-is-more-lethal-than-smoking-heres-what-you-can-do-to-combat-isolation.html and Holt-Lunstad, J., Smith, T. B., & Layton, J. B. (2010). Social relationships and mortality risk: a meta-analytic review. PLoS medicine, 7(7), 859. Buettner, D. (2017). Blue Zones of Happiness: Lessons From The World’s Happiest People. I teach you practical strategies that trigger upward spirals of health and happiness.